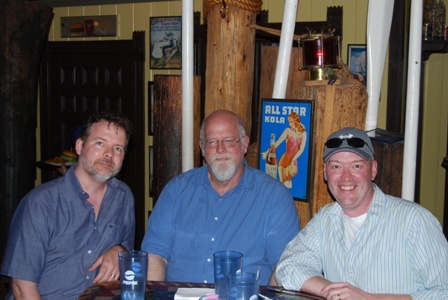 John O'Neill, Jeff Easley, and me before the waitress kicked us out. Ok, so here’s the deal, I like art. Yeah, I know, that’s hard to believe and all, but it’s true. This passion of all things visually marketed in oil, acrylic, water-color, and the like brought me to Art Evolution, and from that platform I’ve fostered many great relationships with artists. Jeff agreed that something like that might be a fine idea, and from that point a rather fantastic journey began. Now of course there will be no spoilers here, but I will tell you about the rather grand trip I’ve just completed in conjunction with one of the stages in this book’s creation. On Monday, June 6th, I took a personal leave from the Black Gate L.A. offices to head to Lake Geneva Wisconsin by way of Chicago. Now all of you who know Black Gate, know that our fearless leader, John O’Neill, houses our central offices in the BG Tower in Chicago, so it was no surprise when news of my trip was intercepted by John. Divulging that I was meeting with Jeff at Popeyes, a fantastic little restaurant and hub of Lake Geneva culture, John said he’d be obliged to come as well… and so he did. 30 years, and I FINALLY have my MERP Map! The dinner was a fantastic success, Jeff being reserved and polite while John was funny as always, stories going from John’s inability to follow any type of driving direction to Jeff’s days playing D&D on lunch breaks at TSR with Elmore, Caldwell, and Parkinson. Note: Don’t let Jeff play a wizard with the fireball spell. After the sun went down on the lake, John left our company and Jeff and my chauffer, Brent, drove back to Jeff’s place to begin a massive cataloguing session. Now I don’t know about you, but walking into the home of any artist is a grand time, but doing so in one of your idols homesteads is beyond cool, especially when he’s taken 30+ years of original art and filled the front room of his house with it. Yeah, I had trouble sleeping with anticipation of our morning art cataloging exercises, but I wasn’t disappointed. I was there holding Kara-tur, Darkwell, Sword and Fist, Tome of Magic, and countless other classic paintings. Note: If you’re wondering about AD&D hardcover series originals, you’re out of luck as a member of the band Creed bought every one. It was kind of religious, and I was nearly overcome with the beauty of the oil on canvas, the scans of these images holding only a fraction of the detail, color, and wonder the brush expresses. 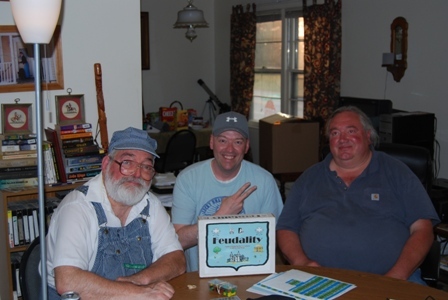 Tom Wham, me, and Ernie Gygax at a gaming table... PEACE OUT! 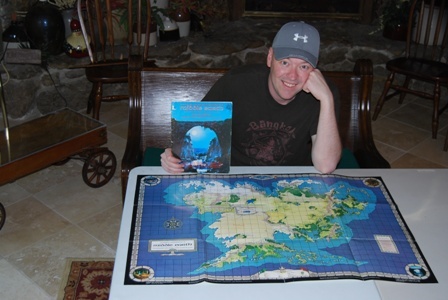 After a half-dozen hours of working with art, we decided to pile in the car and make a thirty-minute pilgrimage to Noble Knight Games where yes, finally, after nearly three decades I was able to purchase the Middle-Earth Map created by I.C.E.! The place was incredible, and their slogan ‘Where the out of print is available again’ was no lie. They even had the original Erol Otus Deities and Demigods cover painting hanging on the wall in all its violet acrylic glory. What next you ask? Well, it’s time to return to Jeff’s place and spend an evening going over interview questions for the book, then to bed, and finally up again to lay into Jeff’s 60’s horror-film inspired homage of an art studio where even more treasures are discovered! A few more edits, pictures, and what’s that… Clyde Caldwell wants to meet in Milwaukee for Thai food? Well, heck ya! 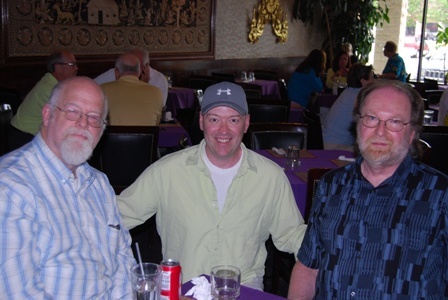 Jeff Easley, me, and Clyde Caldwell... can you guess who in this picture has no artistic talent? But as with all good things, they finally come to an end, but you know what? As I drove down the 294 to Indiana and my old stomping grounds, 1st Edition AD&D character sheets with Easley pictures in the portrait box, I couldn’t help but think how lucky I am and what adventure might lie in store for me and my old gaming buddies as we prepare for a Roslof tribute with a running of B2 Keep on the Borderlands before I fly back to California. After two days and more than thirty hours of gaming, our adventuring party of six explored every room of The Caves of Chaos, as well as finding the Hermit, Lizardmen, and Bandits in the surrounding countryside. The only thing we missed, the Black Widow Spider lair, but man it was still impressive [although two characters did die along the way… I salute you Manfred of the Lake and Tiberius Bronzblade!]. So for all you gamers out there, I salute you, and I hope I’ve done you proud with my RPG road trip. Maybe next time I can take some of you with me, assuming John O’Neill pays the bill! Dinner was indeed epic. Glad we were finally able to meet in person. I envy you that visit to the Jeff Easley art lair! I’m also completely envious of Jeff’s awesome white beard. I vow not to appear again in public until I can grow something similar. It may take years, so first I shall stock up on pop tarts and nutella. Just think, you are doing now what 25 years ago a million of us dreamed of doing. Amazing. And keep us updated on that Easley book! Hooray for the MERP map! Kerstan: I KNOW! And of course I’ll keep everyone updated on the book! Well, SHAZAM!! I guess you didn’t need all my good juju sent your way after all. Or…wait…maybe it WAS my good juju that made your trip such a smashing success. Yeah, that’s it. You can thank me at WFC. Woohoo! Glad it was so great! And so do I!!! Read your blog, that is. <.< I ought to have read this without being prodded to it: MY APOLOGIES! This sounded like a grand trip... ... But WAIT! You were in Chicago, and neither you or John INVITED ME to dinner with y'all? The wounds. The wounds. Claire: According to John, you would have probably been table-dancing by the end of the meal, so we thought better of it 😉 Besides, both our wives would have been far to jealous had you been there!